Data hijacks the Enterprise when he's called home by his daddy. We start on a boy being reprimanded by Riker for playing a prank on his brother by letting him think the boy was dead. He then proceeded to run away and eat a cove palm to survive while he was hiding. What he didn't know is that this cove palm was infected with parasites that could kill him and, if not quarantined, the rest of the ship. Luckily, Beverly got him into quarantine in time, but they have to get to a starbase medical facility fast before he succumbs to the parasites. Except Data, who suddenly received a silent command and is operating single-mindedly, has other plans. Without warning, Data cuts the life support to the bridge, forcing everyone to evacuate except him since he doesn't need life support. 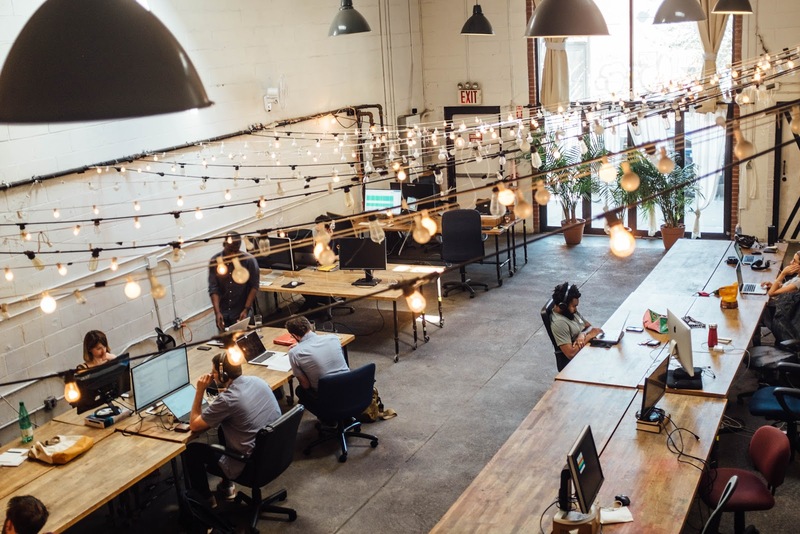 When the crew gets to engineering, they realize what has happened: Data has taken control. Imitating Picard's voice, as Brent Spiner is wont to do, Data programs the computer to only accept commands from the bridge, so the rest of the crew can't do anything from engineering. 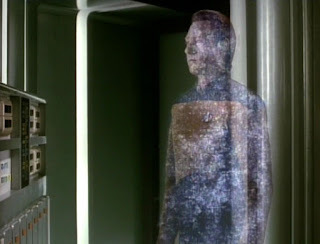 When Data gets to his destination, he programs a series of force fields to direct him to the transporter because the one thing they could do was manually disengage site-to-site transport ability. 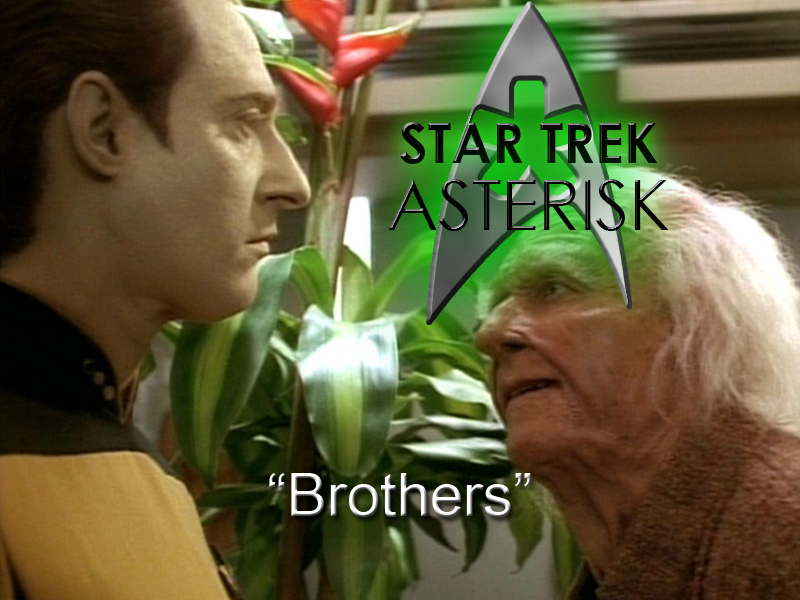 When he gets to the transporter, Riker and O'Brien are waiting for him, but it doesn't matter. 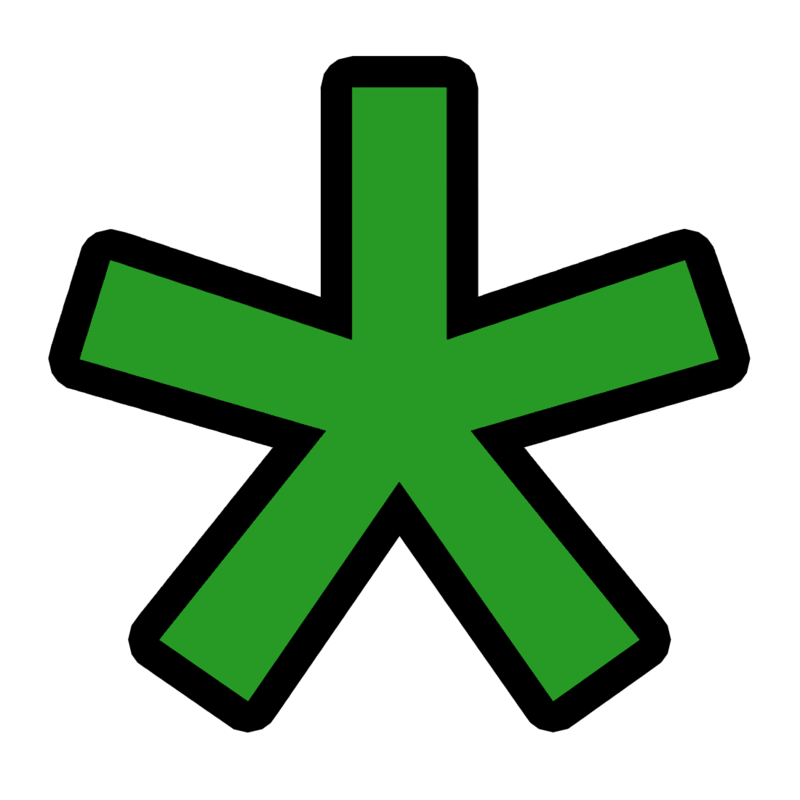 He opens a console, re-initializes site-to-site ability, and beams down to the planet. On the planet, Data finds a wrinkly old man who is apparently expecting him. 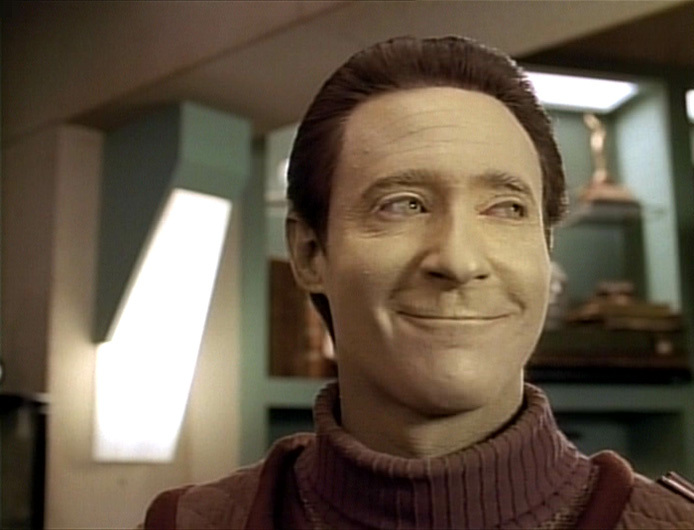 When the wrinkly old man awakens him from his trance, Data remembers nothing about hijacking the Enterprise. The old man reveals that he's Data's father, Noonian Soong. Now, Data was under the impression that he died along with the rest of the colonists who were killed by the Crystalline Entity. Turns out he's alive, he's been keeping up on his son, and he's here to answer questions. So, Data starts asking some, but then the father/son bonding is stopped short by another visitor: Data's evil brother Lore. "Now," Soong says, "It's a family reunion." Lore was called to the planet by the same homing signal that drove Data to hijack the Enterprise, but Soong had no idea that Lore was even reassembled, much less alive. Turns out, after Data beamed him out into space in "Datalore," he was picked up by a Pakled trade ship. No doubt he hijacked that trade ship to get back home. Data warns that Lore is dangerous, but Soong insists that he's just misunderstood. Besides, there are more important matters at hand, for example, why Soong called Data there in the first place. He wants to give him an upgrade: an emotion chip! "Don't worry, I won't steal it." He stole it. After Soong takes a nap before the emotion chip implantation procedure, Lore deactivates Data and takes his place, as is his M.O., and Soong, mistaking him for Data, implants the emotion chip in him. Lore thinks that this will upgrade his emotions because his chip was made from substandard parts. Soong explains that the chip wasn't designed for him; it'll only work in Data. Lore doesn't care. He beams back up to his ship singing some crap about Abdul Abulbul Amir. But not after getting in a fight with Soong and fatally wounding him. Meanwhile, the crew back on the Enterprise has been trying to crack the impossible lock code that Data set on the computer before beaming down. It really is impossible, so Picard looks for alternatives. Riker comes up with the brilliant plan to make the transporter think that he, Worf, and Geordi are Data, so that they can get to the planet surface, find Data and tell him to fix whatever he broke so they can take that kid to the hospital. The plan works, but when they find Soong's building, they find Soong on the ground and Data deactivated in another room. Riker activating the "secret" power toggle. When Data wakes up, he says a tearful goodbye to his dying father. He tells Soong that because the two of them are so much alike, it's okay for him to die. 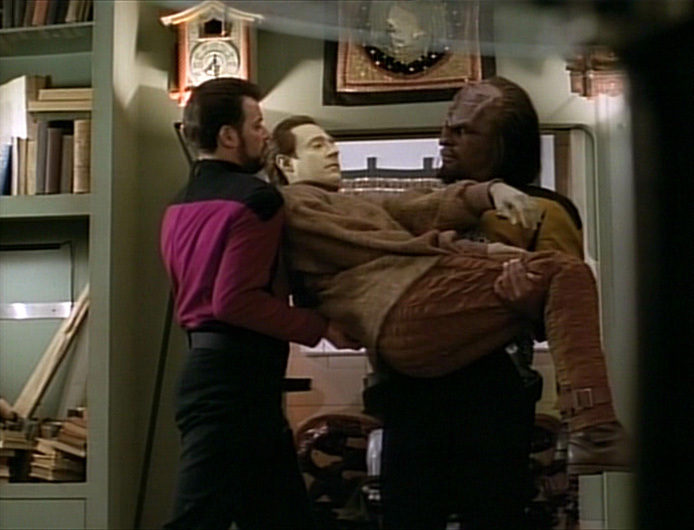 When Soong breathes his last, Data returns to the Enterprise and the boy who was sick is saved. He even forgives his brother for playing a prank on him. Data points out that they seem to be getting along better, and Beverly says that "they're brothers. That's what brothers do. They forgive." Which leaves Data to process information about his own brother, Lore. Who is now somewhere out there with an incompatible emotion chip. In another change for Star Trek story structure, this episode continues an arc that started in season one with "Datalore". It's a change because it's really the first multi-episode story that they've done that wasn't side-by-side with the rest. The emotion chip will be a thread in Data's life through "Descent" parts one and two, and on through the movies, and Soong will be recurring in one form or another in various episodes. This episode really sets the standard that Brent Spiner plays all the Soongs. Lore was understandable because he's another android model, but Soong didn't have to be Spiner. In fact, they looked for a lot of Asian actors before they decided to settle on Brent. I just love the Soong Family, and this is where we really start getting into it. Thumbs up!